I've been playing around with a few new products lately, and I've been gravitating towards a grey eye look. 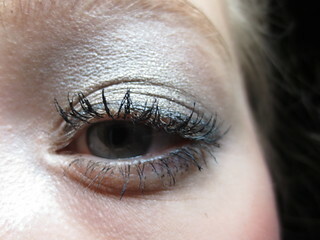 I really like grey and silver shadows in the Winter months, I think it's quite festive! I know the traditional holiday look is a gold shimmery eye, which I love, but this is a nice change. This eye look can be worn with any blush and lip colour, it's quite versatile. Products Used: First I used Maybelline's Color Tattoo in Too Cool all over my lid to create a brightening base. I love these Color Tattoo's since they stay on my eyes all day long, never creasing or budging. Next, I used the Color Tattoo Audacious Asphalt, again all over my lid. I apply these cream shadows with my fingers, but you could also blend them out with a brush. I then reached for my Urban Decay Naked 2 Palette, and used Verve all over my lid. Verve is such a creamy, soft shadow that has great pigmentation and is quite brightening. Next, I used Pistol in my crease. Pistol is a medium-dark colour, and is great at defining your eyes without being too heavy. 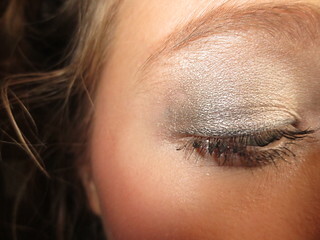 Then, I used my Urban Decay Naked Palette, and applied Gunmetal to my outer corner. I also applied this slightly to my bottom last line. Finally, I used Virgin under my brow bone as a highlighter. For mascara, I used MAKE UP FOR EVER's Smoky Lash Extra Black Mascara* on my top lashes. I've heard amazing reviews on this mascara, and I couldn't wait to try it out for myself. I like the amount of curl and volume that this mascara gives to my lashes. On my bottom lashes, I used Maybelline's Colossal Volum' Express Cat Eyes Mascara in Glam Black. I find that this is a great mascara for your bottom lashes, since the brush is quite small. I normally don't wear mascara on my bottom lashes, but ever since I discovered this mascara I have been! 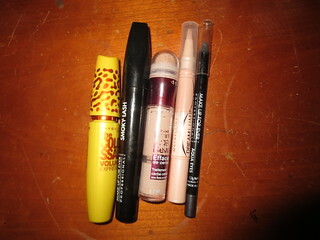 For eyeliner, I used MAKE UP FOR EVER'S Aqua Eyes in 21L*. I really like the formula of the Aqua Eyes line, the liner is creamy, but sets quickly and doesn't budge or smear throughout the day. 21L is a nice slate grey colour, which isn't as harsh as black. Underneath my eyes, I first applied Maybelline's Instant Age Rewind Eraser in 10 Fair. I love this product, it is so easy to apply, and it gives a great brightening effect whilst hiding dark circles. I then applied Maybelline's Dream Lumi Touch Highlighting Concealer in Radiant. This is a similar product to YSL's Touche Eclat, but with a much more affordable price tag. Radiant has a pink undertone to it, and I find that it gives my eyes a brightened appearance. A lot of these products are new to my routines, and I'm really trying to shop my stash. I haven't used my Naked 2 Palette in quite some time, because I've gotten so reliant on my original Naked Palette. I've also been really impressed with Maybelline products! This eye look is a great way to mix in both high and low end products. 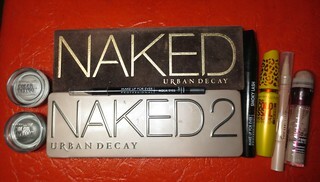 The Naked and Naked 2 palettes are the best ones I own! Great look! They're my favourites as well!